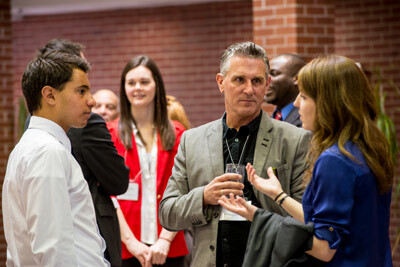 The University of New Brunswick's J. Herbert Smith Centre for Technology Management and Entrepreneurship (TME) is celebrating its 25th anniversary on Saturday, September 28 by pairing up local business owners and CEOs, with recent TME grads and current students for a day of networking, mentorship, and celebration. The guest list includes UNB President Eddy Campbell, and President Emeriti, Elizabeth Parr-Johnson and John McLaughlin; UNB alumni and local business heavyweights, including Naz Ali (Caribbean Flavas), Doug Williams (The Garrison Alehouse), and Rivers Corbett (Relish), TME's entrepreneur-in-residence; and TME students and budding entrepreneurs, including recent innovation competition winners Phillip Curley (HotSpot Parking), and Greg Armstrong (Hyton Innovation). The local breweries and restaurants sponsoring the event - Picaroons, the Lunar Rogue, Relish, Red Rover and the Cedar Tree Café, among others—will host a tasting event at the Alden Nowlan Grad House at the end of the day, providing a networking opportunity for the province’s up-and-coming business and technology leaders to connect with the successful and influential entrepreneurial community over locally brewed craft beer and food. For 25 years UNB's TME program has been providing engineering students and, increasingly, other technically-minded professionals with the business expertise to excel in their career or launch their own company - a move other universities in Canada have just begun to follow. The program now has over 300 students enrolled in TME courses. At the recent New Brunswick Innovation Fund (NBIF) Breakthru competition where New Brunswick entrepreneurs competed for over $400,000 in start-up funds, four of the five finalists were UNB students, and three out of five either consisted of TME students, or had a TME student on the team. "Our entrepreneurs aren't just winning competitions," says Dr. Dhirendra Shukla, chair of the J. Herbert Smith Centre. "We've had a steady increase in the number of successful business launches, and we fully expect this trend to continue." Smartskin Technologies and Eigan are two recent examples of UNB-born businesses that are making waves in the start-up world. To arrange a media interview, please contact Phil Lambert.